The MH490-BH 490 Center Ball Head from Manfrotto is a 3.5" tall, aluminum support with a load capacity of 8.8 lb. The head has a single lever lock, which controls the ball and pan movements at the same time. 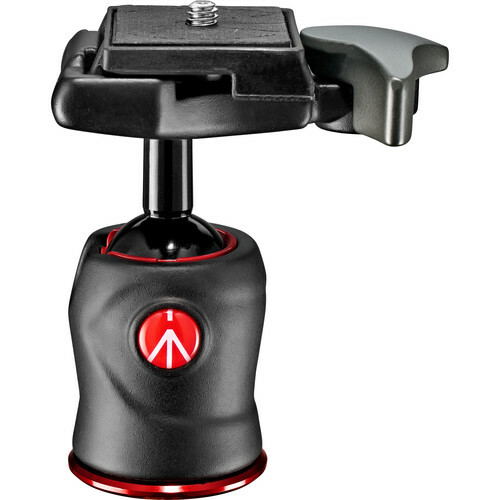 The 7.1 oz head has a cut notch on the side that allows you to position the camera at a 90° angle, and take your camera on and off quickly with its RC2 quick release system. Box Dimensions (LxWxH) 4.5 x 3.5 x 2.55"
490 Center Ball Head is rated 4.0 out of 5 by 1. Rated 4 out of 5 by David from Bought it for my bogan 3021 tr The actual tripod is a complete piece of garbage very early on the legs would not support any kind of weight. Twolegs would collapse. However I got the manfrotto head for it and it is simple construction I have no problem with it but I cannot remove it from the tripod looking for some help to figure out how to do so.